Rethinking 4x in 40 – The Logic Behind Monster Decks. In order to have a competitive deck – your deck needs to have the minimum number of cards possible and the maximum number of key cards. So, if you want to draw fireball consistently, you should have 4 copies of fireball in a 40 card deck. This is the prevailing wisdom in most trading card games and generally holds true for Shadow Era. But it’s not always true, and to understand those exceptions (like 80 card Garth decks) you need to first understand the rule. The math behind figuring out the probability of drawing a single card in a deck is complex (you can read about it here). The most important thing to know about it is that it is tied to deck size, number of matching cards within the deck, and number of cards drawn. If I have 1 Jack of Spades shuffled in a deck of 4 cards, and I draw one, then I’ll have a probability of 1/4 to draw that Jack of Spades. If I increase the deck size to 10, my probability will drop to 1/10. For this reason, if drawing a Jack of Spades will make me win, I want to minimize the size of my deck. Similarly, if I have 4 Jack of Spades in a deck of 4 cards, my chances of drawing a Jack of Spades now goes up to 100%. If I increase my deck size to 10, I’ll still have a 4/10 chance to draw a Jack of Spades. Now if I have 1 Jack of Spades in a 4 card deck, the first card I draw has a 1/4 chance of being a Jack of Spades, and if it isn’t the next card I draw will have a 1/3 chance of being a jack of spades. When you combine them, there is a 50/50 chance that the Jack of Spades will wind up in the 2 cards I drew, or the two cards left in the deck. So drawing 2 gives me a 50% chance of getting the Jack of Spades. There is a nice page that will calculate probabilities of drawing specific cards here. Since many effective winning plans can be put together with just a few target cards, it is generally a good idea to maximize your probability of drawing those cards. If we can make a deck where we will have the maximum probability of drawing Kristoffer, Puwen, Aldon, Fireball and Supernova, we have a good chance of winning. Indeed, you could probably make a winning deck with 3 copies of each of those and nothing else. But the game doesn’t let you do that. The game gives you a minimum number of cards allowed of 40 and a max number of each card of 4. Still players often want to get as close to that ideal opening hand as possible, and so they make sure to have 4 copies of each of those cards and some draw cards to make sure that they increase their chances of getting those cards when they need them. This represents an attempt to min-max to increase specific probabilities. When you include 4x a card in a 40 card deck, you wind up with a 55% chance of drawing at least one copy of that card in your first 7 cards. In those above examples, we start from the assumption that we need a specific card or combination of cards to win. If you don’t have Kristoffer in your opening hand, Aldon is not as great a card. We really want both of them, and so we need to really maximize our probability of getting both and we need to make a targeted deck. But what if you didn’t need a Jack of Spades to win the game? What if all you needed was a Jack? Or a face card? 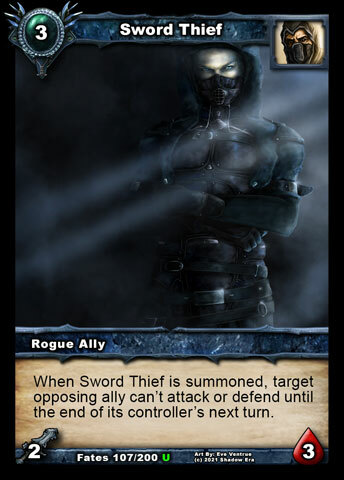 The game only allows us to have 4 Sword Thiefs in our deck, but if we don’t care whether it’s Sword Thief or Layarian Seductress, then we can have 8 copies of 3cc ally tie-up equivalents in our deck. If we can do that sort of thing, then that 4x in 40 rule need not apply. 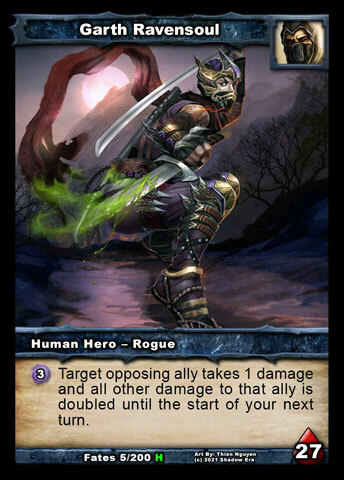 Certain heroes like Garth (credit to BP Shadow Mann for being the first to figure out a competitive 80 card Garth deck – and later a solid 120 card Garth) make this sort of thinking much easier – since Garth can amplify the power of any ally or weapon – allowing you to consider allies as being roughly equivalent along different themes. For example – in my newest Monster Garth deck, I broke down my cards along the themes of “Holding Board” (34 cards), “Taking Board” (21 cards), “Draw/Pseudo Draw” (35 cards) and “Utility/tech” (25 cards) . Most of the cards in the deck fill at least two of those roles, so when I look at the whole 80 card deck, my chance of having at least one card geared towards “holding the board” in my first 7 cards drawn winds up being 98%, with a 90% chance of getting a card geared towards “taking the board” and a 99% chance of getting at least one draw card. If it doesn’t matter which one of those I get, I’m in really good shape. 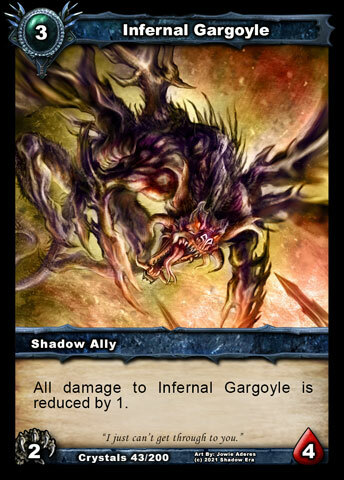 This idea of interchangeable cards along themes wasn’t really possible in the early days of Shadow Era. There were limited cards to choose from, so choosing cards that were roughly equivalent wasn’t possible. A huge deck meant you might not get Ley Line Nexus when you needed it – and that could just make you lose games. There were two things that made it possible in Shattered Fates: General Hero Abilities (already there from the start) and a critical mass of cards. In Lost Lands, the Seek Mechanic has further enhanced our ability to make huge and consistent decks. The odds of drawing your hero card are 100% so the more generally useful your hero ability is, the less importantit will be for you to draw any specific cards. Consider heroes like Garth, Boris, Tala, Zaladar, Aramia, Banebow, Skervox, Victor and Moonstalker. Those abilities will have an impact on the game no matter what cards you’re holding. All you need is enough cards to support the themes where they excel. If you can manage this, you can probably make a decent oversized deck. 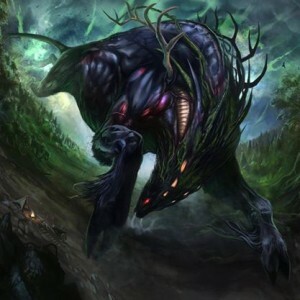 I think Garth is the best example, since he makes an ally with 2 attack (or a weapon) able to kill an ally with 5 hp. Contrast those heroes to heroes like Vess or Serena – potentially strong, but they do best when they get their key cards. As the game gets older, we get more and more cards that do similar things. There are so many ways to draw cards now: some are slightly better than others – but there are enough decent draw engines that you can give yourself a fairly high probability of getting at least one draw engine in an oversized deck. Indeed – with an oversized deck, you can get sort of silly with draw, increasing your chances of drawing to much higher than they might be in a typically sized deck. Along those lines – you wind up with a lot more options for allies in various roles (early game, mid-game, late-game, utility, taking the board, holding the board, etc.). Having so many options means you can make sure to have your bases covered. If you don’t draw Eternal Troll or Night Owl, you may still draw sword thief or Layarian Seductress, and any of those might help you in one way or another. If we’re in a position where two people might choose two different cards in the same role to make two separate decks that play roughly equivalently – then you might do just as well to combine both of those decks together. For example, one person might make a deck that uses Layarian seductress and Night Owl and draws cards using Confluence of Fate and Backstab. That’s perfectly respectable and could probably do fine, competitively. Another person might use Eternal Troll and Sword Thief and draw cards with Ill-Gotten Gains and Treasured Heirloom. That’s another perfectly respectable choice. You could easily combine those two decks and wind up with a deck that has a good chance of drawing one of those 3cc allies and one of those draw engines. The probabilities wouldn’t change much – it just would be harder to predict which draw engine or 3cc ally you’ll get first. As a general rule, the more cards that are available in the set – the more viable oversized decks will become and the easier it will be to make competitive 60, 80 or even 120 card decks. Which is better? Do you need to choose? The newest little wrinkle in this rule of 4x in 40 is the new seek mechanic. 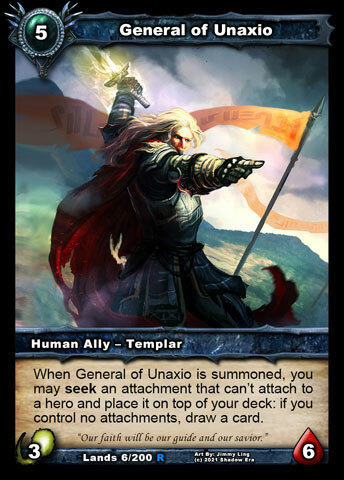 In my new Garth deck, I’ve got two cards that can seek other cards: Vigilant Wisp and General of Unaxio. Because of this, it greatly increases my chances of drawing certain key cards. For example, if I’ve got 4 copies of Treasured Heirloom and 4 copies of General of Unaxio in my deck then I have a 49% chance of drawing each of those by turn 6. If I assume that I’ll use General (if I don’t get heirloom) to seek an heirloom, then my odds for having Heirloom by turn 6 is very high (about 75% and this goes up if I draw extra cards or go second). So seeking lets you greatly improve the chances of getting key cards – assuming you can play the seeker card successfully. This other little feature of seek allows you to include cards that might not otherwise make sense – especially in a 40 card deck. The perfect example is Nowhere to Hide or A Legend Rises – both potentially suboptimal or useless cards in many games, but in others they can completely turn things around. Having a single one of these in a 40 card deck can be worthwhile – but what are the odds you’ll get it when you need it? Also, the card will often show up as a dead draw – and that’s going to mess with the deck’s consistency. If it’s a single tech card in an 80 card deck, your chances of drawing it are very low – however your chances of being able to seek it are still decent. All I need is to either draw it or get one of my 4 generals to seek it for me. That gives me a 56% chance of getting Nowhere to Hide by Turn 6 if I want it and only a 15% chance of drawing it by turn 6 if I don’t want it. There are disadvantages in going oversized – if there is a clearly optimal choice for a specific role (for example Ill-Gotten Gains is probably a better draw engine than Confluence of Fate) then mixing and matching lowers your chances of getting the optimal card. You may have to make due with a suboptimal draw engine. So why would you do this? Oversized decks have other advantages that make this worthwhile – first, they are unpredictable. This can seem like a drawback, but consider it from the opponent’s perspective. They probably know that I will try to draw in some way, and I will try to claim the board in some way – but beyond that, they cannot predict exactly what cards I’ll play. This gives me the advantage of surprise. 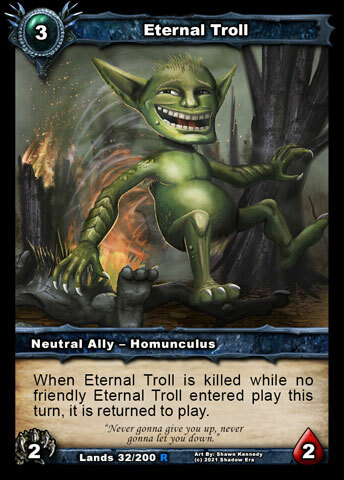 In a 40 card Garth deck – the opponent would be wise to hold onto item destruction to take out Ill-Gotten Gains or Anklebreaker. Against an 80 card Garth deck, that might pay off…but it might not. I might go the whole game drawing entirely with attachments, bad santa and ally based draw. They can’t predict my exact strategy, but I’ve got enough of the right general ingredients that there’s a good chance I can put together a winning strategy with the things I draw. Another advantage of oversized decks is that they can carry odd bits of tech that you might not use in a normal deck. I already gave examples of one-ofs that I can seek, like nowhere to hide. I can also just include a few anarchic lootings. They work sort of like stop thief, but they can also help a ton against stall or combo decks. Since those games tend to go on a long time, I can be sure of drawing at least one if I need it. Another big advantage of oversized decks is they automatically include the stall win-condition. If I can survive until my opponent draws all their cards, I will probably win. Ideally, I’ll win before then, but even if they can keep up with me all game, they run out of steam when they run out of cards. Similar to the whole surprise concept is the idea that if you make a competitive monster deck – it will be very hard for others to copy it. Most 40 card decks, I can play against once or twice and then immediately go to the deck builder and copy them. I know what cards they carry, I just need to make educated guesses about the amounts of those cards. If I play against someone with a monster deck, they won’t see all the cards in my deck in a single game, or even two or five. I spectated BP Shadow Mann’s games for a week trying to reverse engineer his Monster Garth (before he finally posted it in the shadow era forums). I sat there with a piece of paper writing down precise counts of the different cards I saw played – and still I got it wrong, since he was tweaking the deck the whole time. It was slightly different from one game to the next! Similarly, I watched tons of Jojiwakabayashi’s Fat Zhanna games and never really got a satisfactory copy of his deck. Kyltz was nice enough to give me his approximation, and I wound up building off of that as I explored those decks. Making a monster deck takes more time than making a 40 card deck – some of the same general rules apply – you want to have a sense for its resource curve and some general plans…But it’s too many cards to easily visualize what an average opening hand will be – in fact it’s impossible to predict what an opening hand will be. For this, I think it helps to break down cards into general themes, like I suggested. Consider the different classes of cards you might want in the deck, then choose cards that fit those classes. The hardest step is then taking those classes of cards you’ve put together and tuning them into a competitive deck. The problem is going to be that every game is so different so the issues with your deck won’t be obvious at first. Because of this, you have to test these decks a LOT more than a typical deck. As you test it, you can tweak it in minor ways – like a cook adding spices to chili. You might notice that it’s losing a lot to early rush – so you might add some rush counters – perhaps some cheap allies, or perhaps some health gain. The problem is that there’s no easy formula for this, and so it winds up being a long and intuitive sort of process. One other important tip when building oversized decks is that you need to be cautious when using combos. You can break combos into different categories – some involve cards that are good on their own but better in the combo. Others involve cards that are only good as part of a combo. You should avoid the later in a monster deck. Unless you are using seek or glass chalice of knowing to put together the pieces of your combo, you cannot rely on consistently getting it together in a timely matter. If that’s important for your deck, you should really be aiming for a 4x in 40 deck. All of this goes to say that while 4x cards in 40 card decks can help to make optimal decks, it’s not always necessary. It is still the best way to go when you need specific cards or specific combos (and seek will not help you get those combos/cards). It may not be the best way to go when all you need is a class of cards (like a specific type of ally, or draw, or an ally with a specific cost). In those cases – making a bigger deck may not hurt your odds of getting the cards you need (it may even help) and it may confer extra advantages (like a win condition where the opponent runs out of cards). Making Monster decks can be very difficult, but it can be worth it. Garth is the best hero for this sort of thing IMO, but other heroes are also capable of making good over-sized or monster decks as well. Stay tuned as I’ll be posting my new Garth deck along with a new Trolling it Up episode where we pilot it in a week or so. BobRoss has been using the pseudonym (based on the television painter, Bob Ross) since he first got AOL in 1993. He's got a Ph.D. in Clinical Psychology and has been an avid video game player and computer user his whole life. He used to love Magic The Gathering, also way back in those AOL days, and has been playing Shadow Era almost since its inception. He has been mostly a casual gamer, but recently took a more active role in the community with several articles on Shadowera.net and by participating in the World Championship tournaments, where he earned the title of Regional Champion for Europe and Africa (although he lives in New York).